If your order weighs less than 13 ounces, save huge on shipping with USPS first class (with tracking number). This product weighs 10.6 oz. 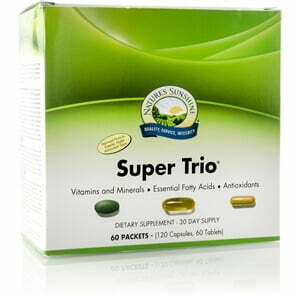 Nature’s Sunshine Super Trio combines three Nature’s Sunshine formulas for a convenient and powerful nutrition. 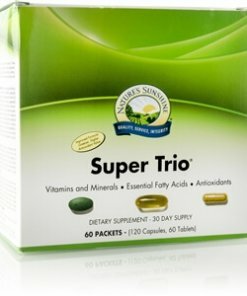 The product should be taken twice a day and includes 60 packs, one full month’s supply, of three supplements each including Nature’s Sunshine Super Supplemental, Super Omega-3, and Super ORAC. Super Supplemental provides 100 percent of daily value of 12 key vitamins and is a rich source of 13 essential minerals as well as several other nutrients. The formula offers nutritional support that many modern diets lack and promotes eye health, cardiovascular health, digestive health, glandular health, and skin health. Super Omega-3 offers essential cardiovascular support through two key omega-3 fatty acids, EPA and DHA. Both of these omega-3s have been found to potentially lower the risk of coronary heart disease. They also play a key role in the health of cell membranes. Super ORAC blends herbs rich in antioxidants that are key to protecting the body from the harmful effects of free radicals. While free radicals occur naturally in the body, other factors such as environmental issues, physical stress, or illness can generate more. The antioxidants in Super ORAC assist in neutralizing free radicals and may decrease or prevent damage. Instructions: Take one packet, twice per day.